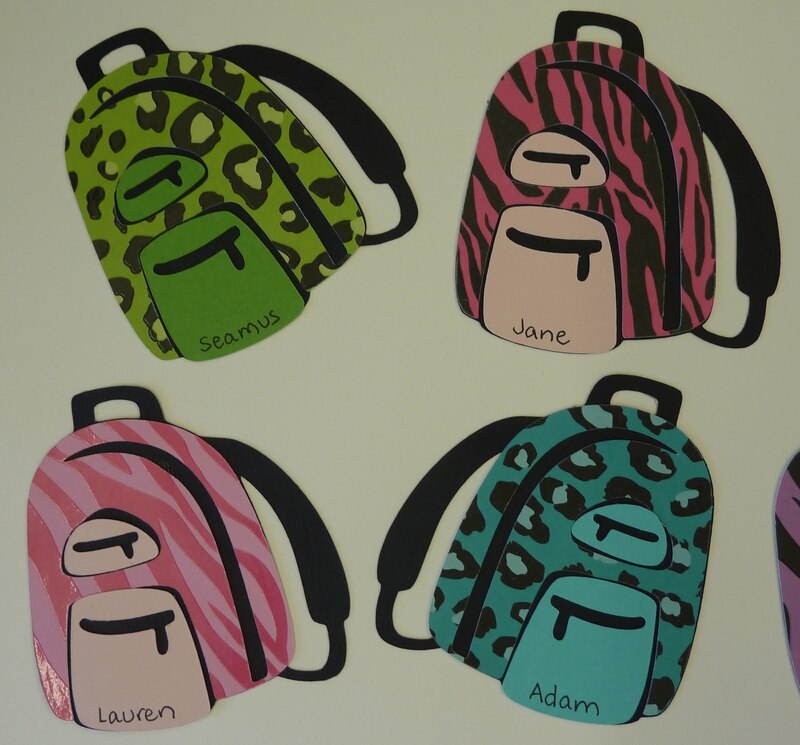 Okay, here are the bookmarks that I made for my students for their first day of school. I used my favorite animal print paper again. These were pretty easy to make on my Gypsy. For each one I took the bookmark shape from Plantin Schoolbook and sized it at 6.18" x 1.76". I added the name inside it using the Feeling Groovy font at 1.5". I cut this in the patterned paper. 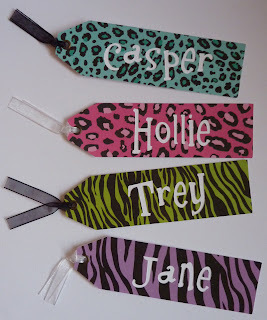 Then I also cut the bookmark shape without the name in white for the backing. After adhering them together I added an eyelet and some ribbon. 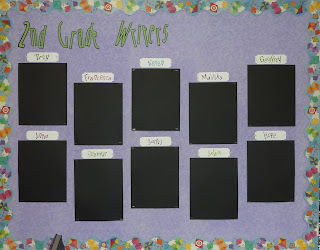 I also used the letters that cut out of the bookmarks to make nameplates for my writing bulletin boards. The shape that I glued the names on is from the Art Philosophy cartridge, and I stretched it in my Gypsy to fit the names. 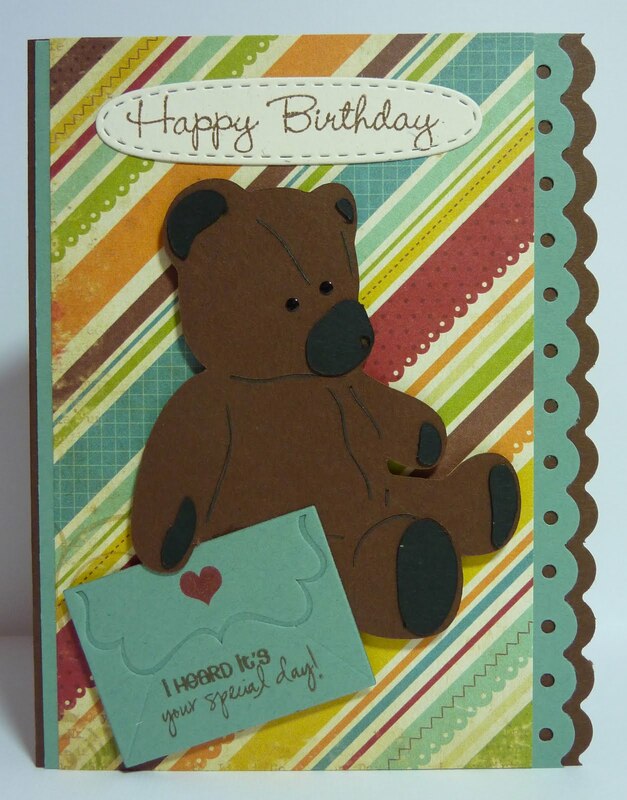 I also ran it through the Cuttlebug with the Polka Dots Embossing Folder to give it some texture. 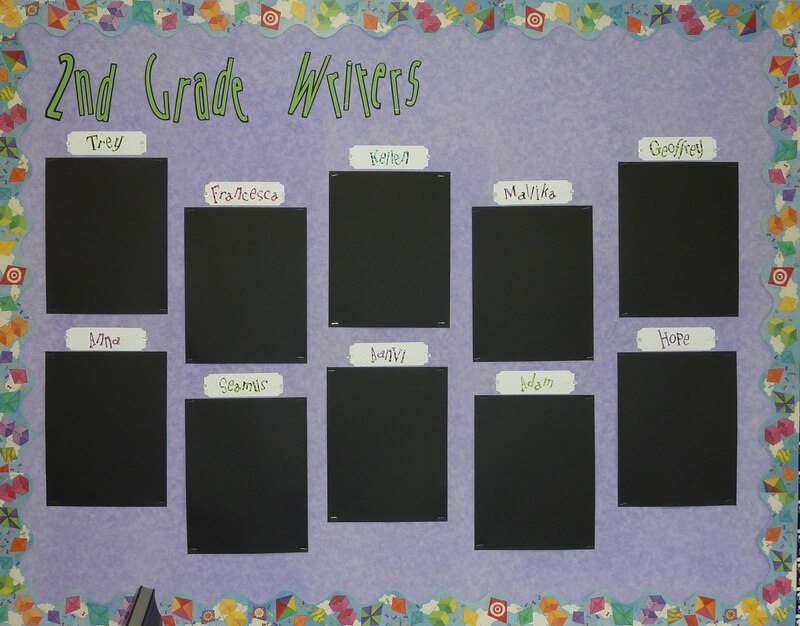 Here's a look at the 2nd grade writing board. I used my Jubilee cartridge (thanks, Kim!) for the title. Sorry the picture isn't the greatest. I didn't realize it until I got home and loaded it onto my computer. 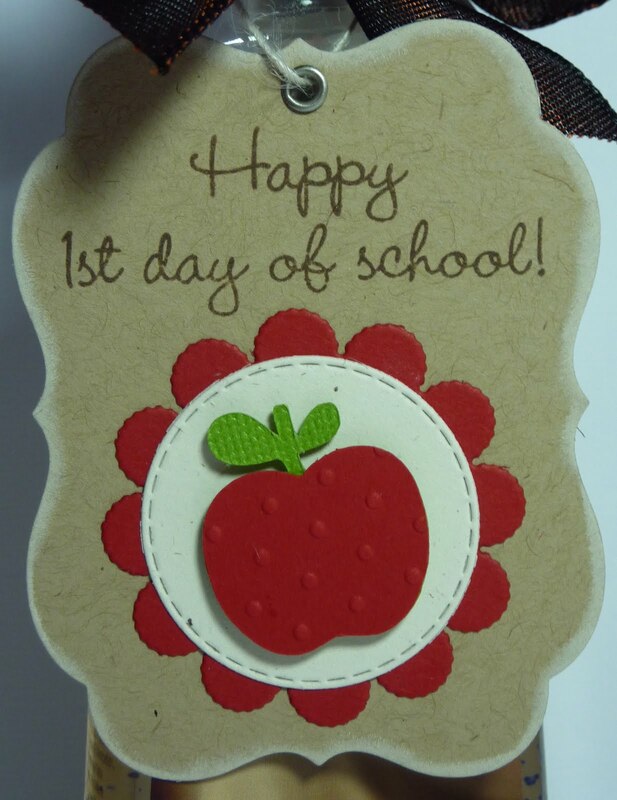 Today is my first day of school! I've been crazy busy for the last couple of weeks getting my classroom ready, but it finally all came together. 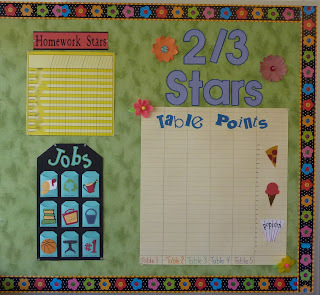 I thought I'd share with you some of the ways I use my Cricut in my classroom. This is the welcome poster that faces out the window in the front of my classroom. I found this awesome animal print paper (Safari Untamed by The Paper Studio) at Hobby Lobby this summer and just knew I had to use it. 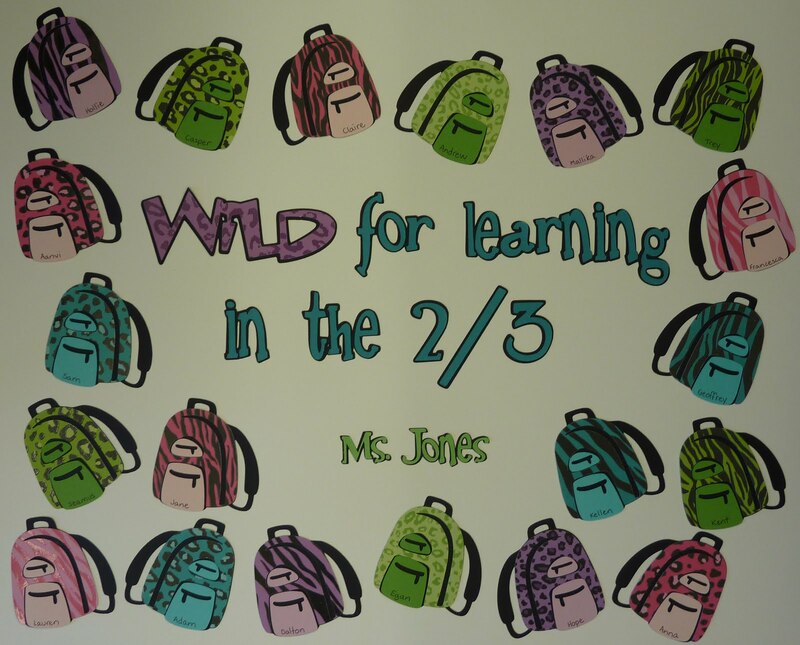 My backpacks are from the Recess cartridge, and I used the Feeling Groovy font cartridge for my words, except for "Wild", which is from Straight From the Nest. 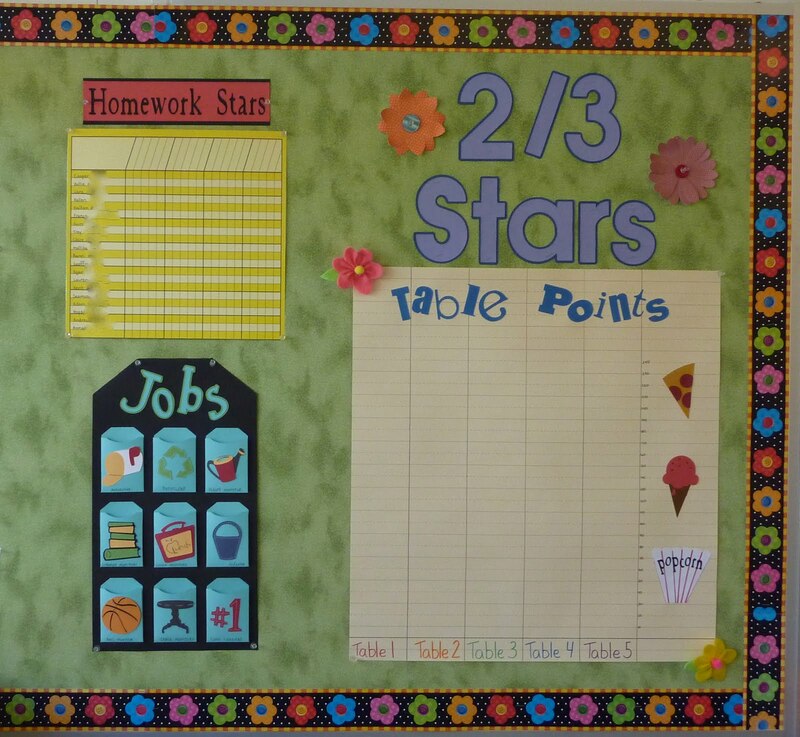 The Cricut is great for making titles for bulletin boards. I especially love tall, narrow fonts that don't take up too much room. This one is Cricut Classic Font, Tall Ball. I love being able to weld the letters on my Gypsy so they are a snap to pin up. 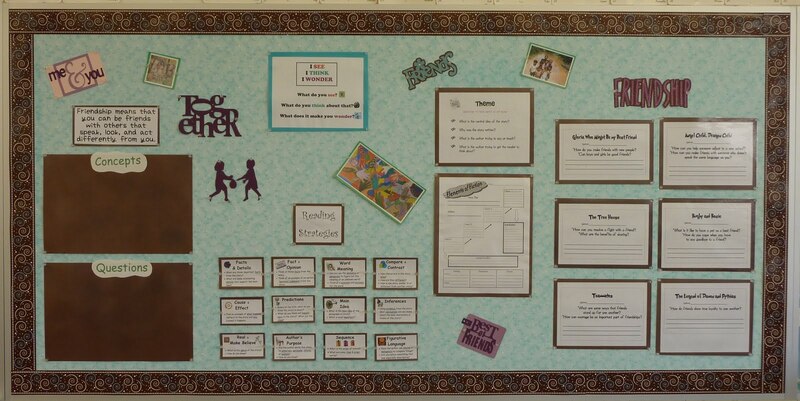 For my reading bulletin board, I used lots of different cartridges that had cuts relating to our Friendship theme. This is a little board next to my desk. I made that job chart last year, and was happy to have it survive the year! You can look at this post to see it in more detail. I think the "2/3 Stars" is from Nate's ABCs, and the "Table Points" is from the Creative Memories Cheerful Seasons cartridge. The paper flowers are cut from Flower Shoppe, but I can't take any credit for the cute felt flower pushpins. Those were made by a former student of mine, who is very talented! My students are arranged in table teams, and they work hard to earn points. 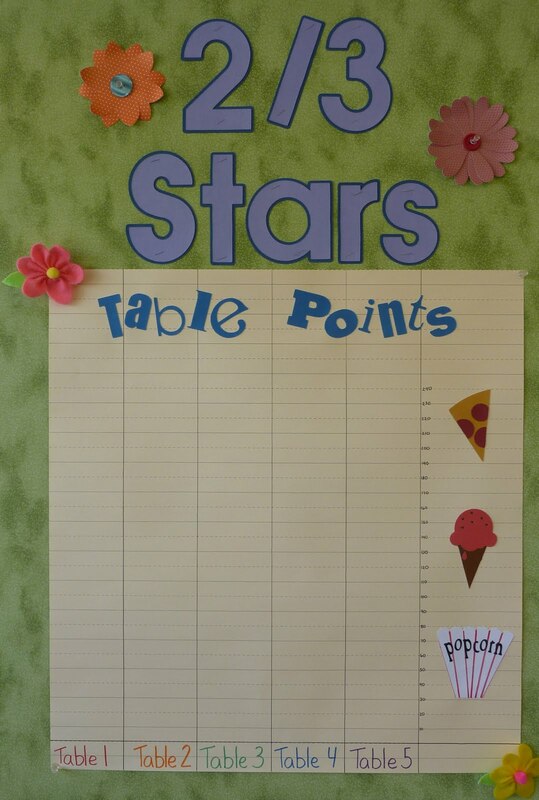 I record them on this chart, and when we reach the top of the popcorn, we have a popcorn party, and so on. It really only ends up to being three parties in the year, but the kids LOVE it! I'll be back tomorrow with a couple of more things to share! We head back to school next Tuesday, and I wanted to get a little gift for my colleagues. A couple of weeks ago I took my son back-to-school shopping at the outlets, and Bath & Body Works had their bottles of scented hand sanitizers on sale, 7 for $20. I decided that would be the perfect thing to keep my friends healthy, so I picked up a bunch and decorated them with some ribbon and a tag. To make my tag, I started with a shape made with the Papertrey Ink Mat Stack 4 die as my base, and I inked the edges with Vintage Cream ink. 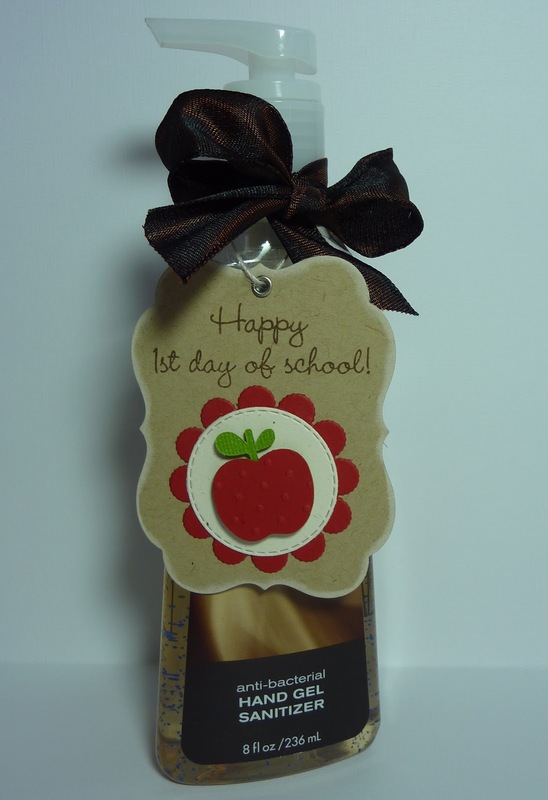 I then took the "Happy 1st Day of School" stamp from the My Creative Time Gift Card Sentiments stamp set. This is one long sentiment, so to fit my tag, I covered one part of it at a time with scotch tape while I inked it up. In this way, I was able to turn it into a two-line sentiment. I cut a 1.08" apple from Create a Critter, ran it through the Cuttlebug Swiss Dots folder, and popped it up on a circle and scallop created with the My Creative Time Scallop & Stitched Circle Dies. A little eyelet finished it off nicely. Last year my sister gave me a bottle of apple scented hand sanitizer, and my students loved it! They all asked their parents for different scents for Christmas and loved sharing them with each other. The bonus was that we were the healthiest class in the school. It really worked! 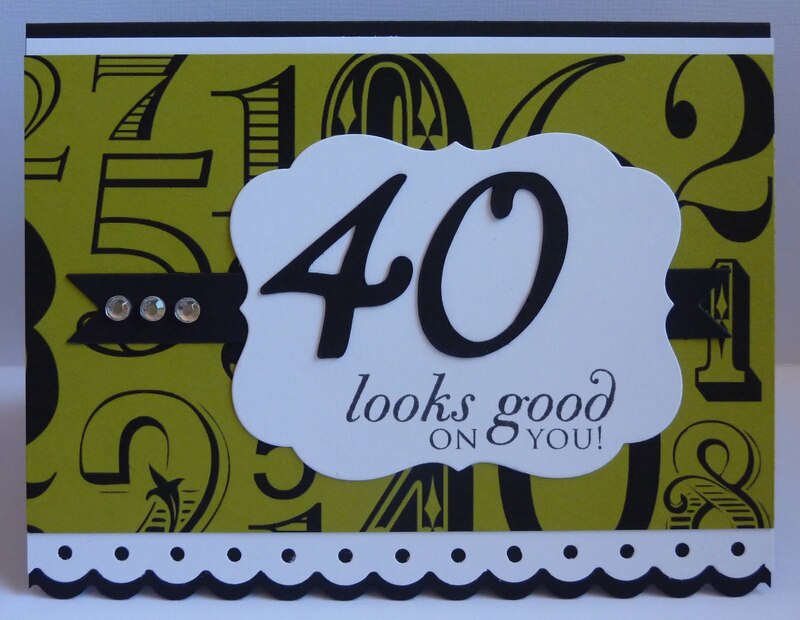 My Creative Time "Scallop & Stitched Circle Dies"
Here's a little 40th birthday card I made for a friend using lots of different tools! 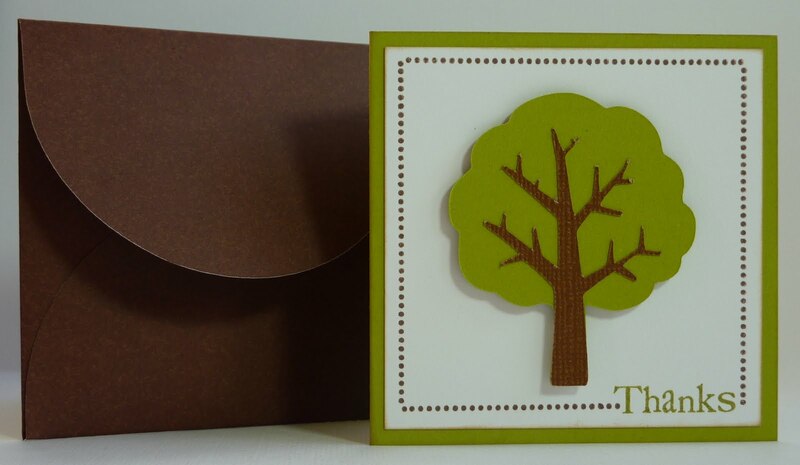 I began with an A2 size card, and I trimmed the card base and my white layer with a Fiskars punch. I then printed my number background paper by using the Black & White Imagine cartridge and chartreuse cardstock. The banner and topnote shapes were made with Papertrey Ink dies. 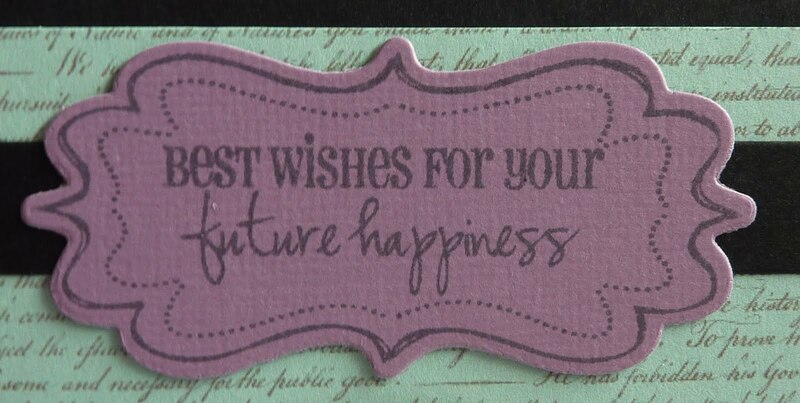 I used the Papertrey Ink Big Birthday Wishes stamp set for my sentiment. They sell coordinating number dies, but I discovered that if you cut the numbers from the Cricut Nursery Rhymes cartridge at 1 3/4", it's a great match. Today Emma and part of the My Creative Time design team are pulling out their Imagines or patterned paper! Anything goes today, so I decided to make a wedding card for a colleague who got married this summer. This gal is a little unconventional (she went off and got married in a small ceremony without telling any of us beforehand), so I thought my unconventional colors would work out fine. I began by printing my text background from the Lori's Garden Imagine cartridge. On the top right of this picture you can see how this pattern prints on white cardstock. I wanted something a little different, so I took the aqua cardstock on the bottom right. When I printed it, I got the look on the left! I printed a 6" square, but ended up trimming it down to a 5 1/2" square. The black layer is a 5 3/4" square, and the card base is a 6" square. I also used my Imagine to print polka dots from the Black & White cartridge on some purple cardstock, and ended up using that to cut a layer for my car. 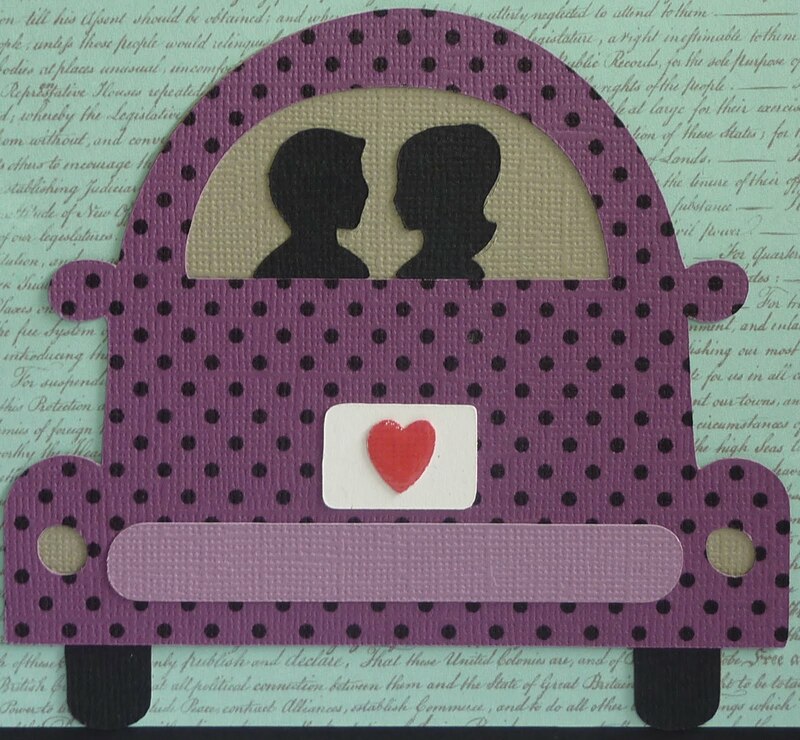 The car is cut at 4" from the Sweethearts Cricut cartridge. After assembling all of the layers, I put some glossy accents on the heart on the license plate. My beautiful sentiment is from the My Creative Time Many Greetings stamp set, and I stamped it on paper that I die cut and stamped with the Fancy Frames Stamp & Die Set. I love how so many sentiments from many of Emma's stamp sets fit in this pretty frame. Click here for ordering information. 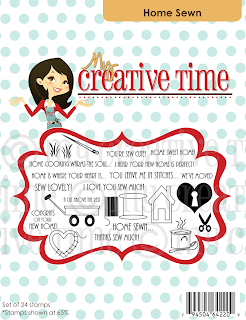 Don't forget to stop by My Creative Time to see what Emma and my design team sisters have in store for you today! I have lots of winners to announce today, but first I want to take a moment to welcome all of my new followers and to thank ALL of you for your sweet comments here and on Everyday Cricut last week. I just loved reading all of them! You are so creative. You have original ideas too! I'm always looking for different projects to do at home. Plus, I love these stamps! I just came over from Everyday Cricut for the first time! Thanks for sharing! Adorable!!! Love all the colors you chose, nontraditional but look great. I love everything you have done! Love this card! You did a super job! Oh my would I love to win this! This is one I did not order last month but know I would use it! Great house and matching card! TFS! Congrats, ladies! Please click the "Contact Me" button at the top of my blog and email your mailing address to me. You will love these stamps! 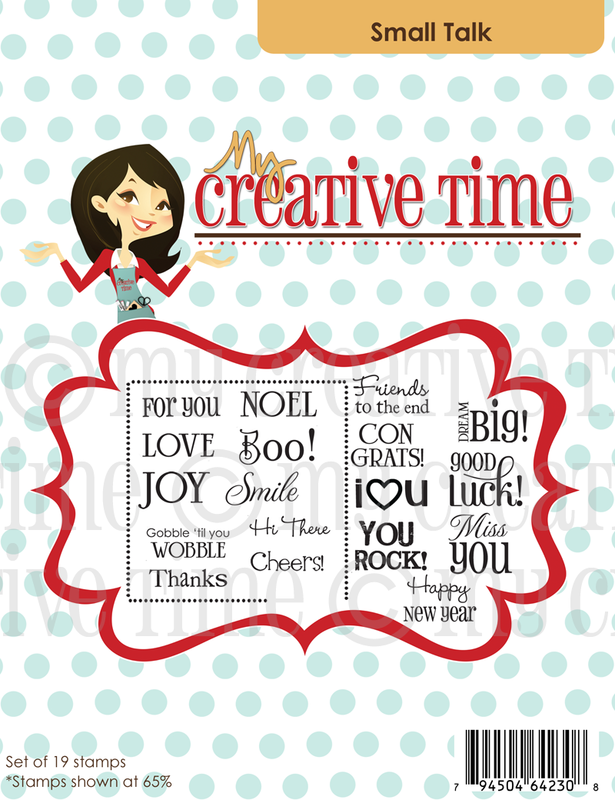 And, for those if you who were not the lucky winners, you can click here to purchase any My Creative Time stamp set. Today's the day! 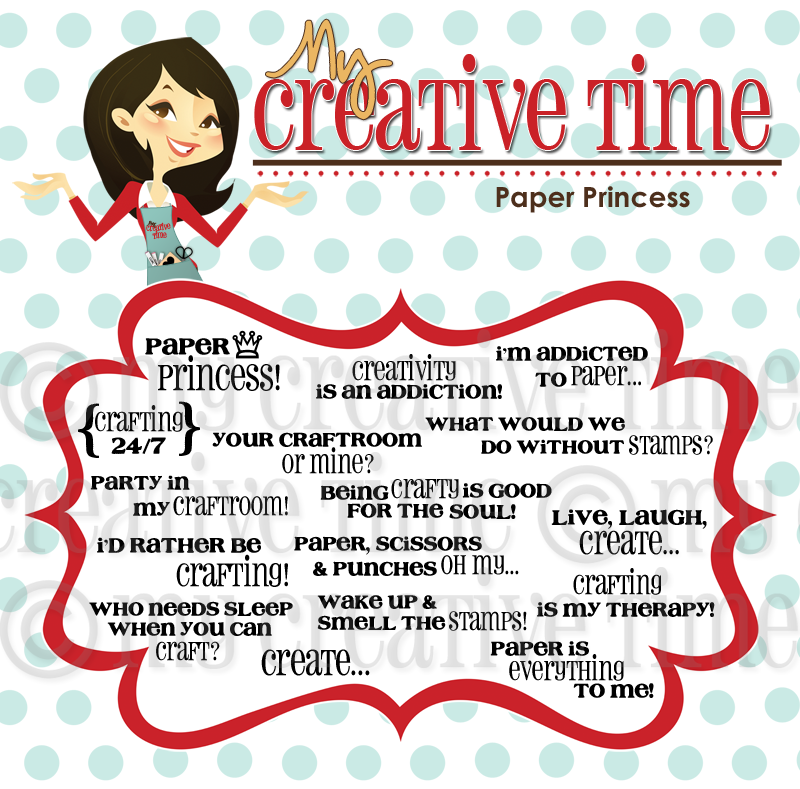 It's the My Creative Time's August Stamp Release Blog Hop! I don't know how Emma does it, but each release is even cuter than the last! 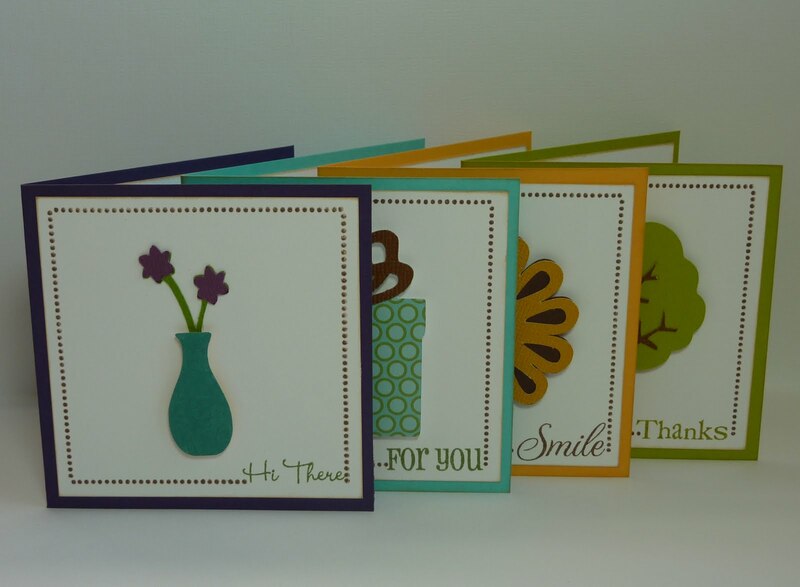 You will love all four of her new stamps sets and the three brand new dies! If you haven't been to Emma's site yet this morning to see her video introducing all of the new products, head over there now. I made this card for my brother and sister-in-law, who just bought a new house. The card is a 3 1/4" square, and I made a matching 3 1/4" envelope from the Walk In My Garden Cricut cartridge. 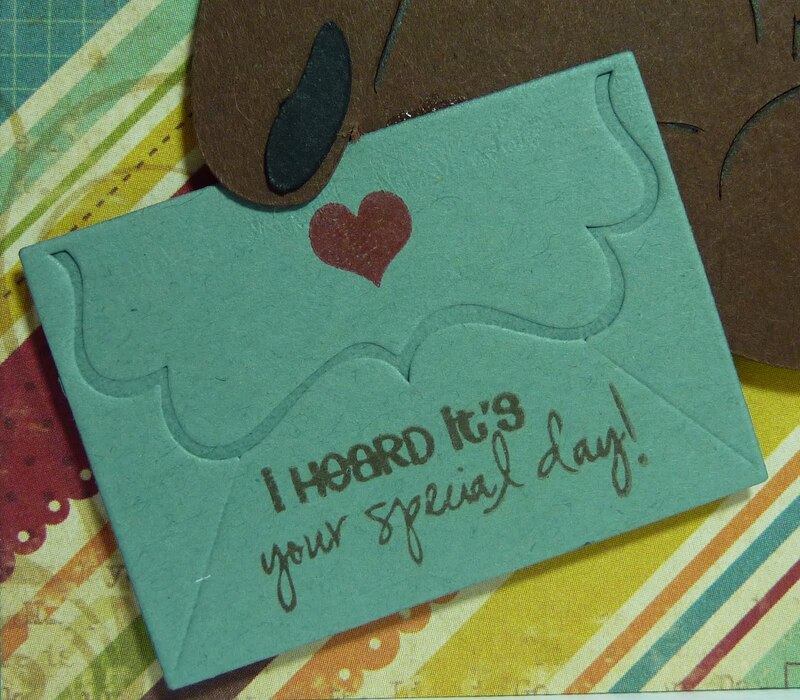 The aqua layer on the card is a 3" square, stamped with the Papertrey Ink Background Basics: Twinkle stamp set. To decorate the card, I used two of Emma's brand new stamp sets. 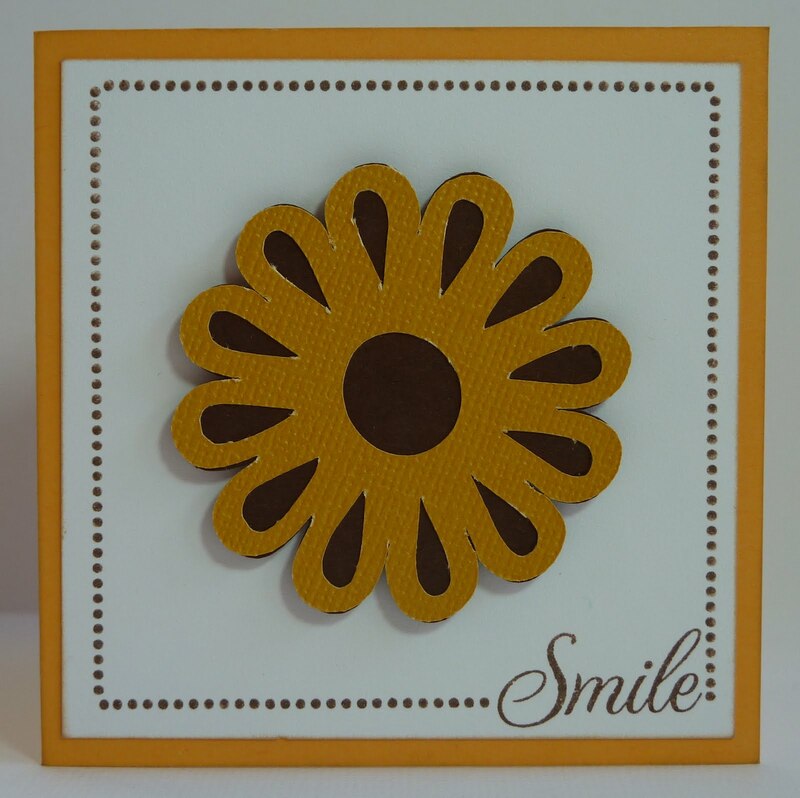 The first one, Small Talk, has this great dotted frame that is perfect for 3" cards. It comes with lots of sentiments that fit in the corner of the frame. 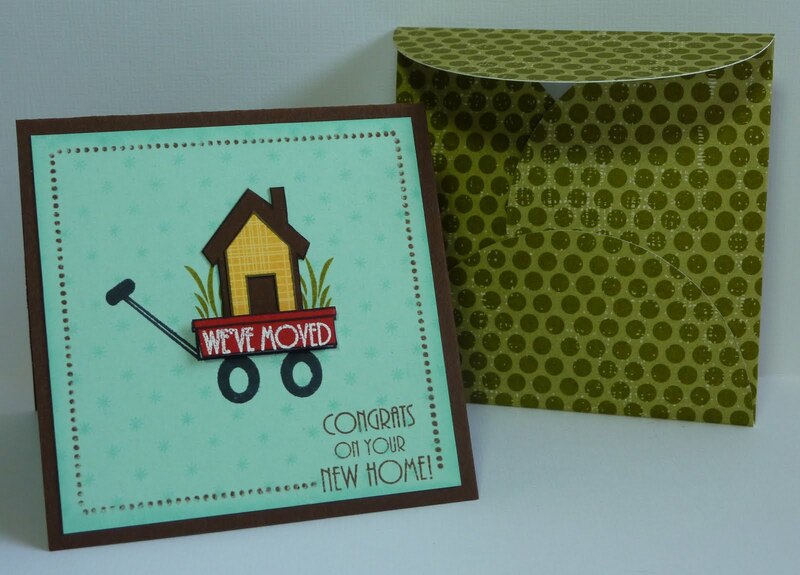 However, for this card, I really liked the "Congrats on your new home" sentiment from Home Sewn, and it fit perfectly in that spot too! Click here for ordering information! There is an adorable house image on Home Sewn that fits perfectly into the wagon. There are even little patches of grass to add to the sides! I stamped my wagon twice, once on the aqua background paper, and once on red cardstock. 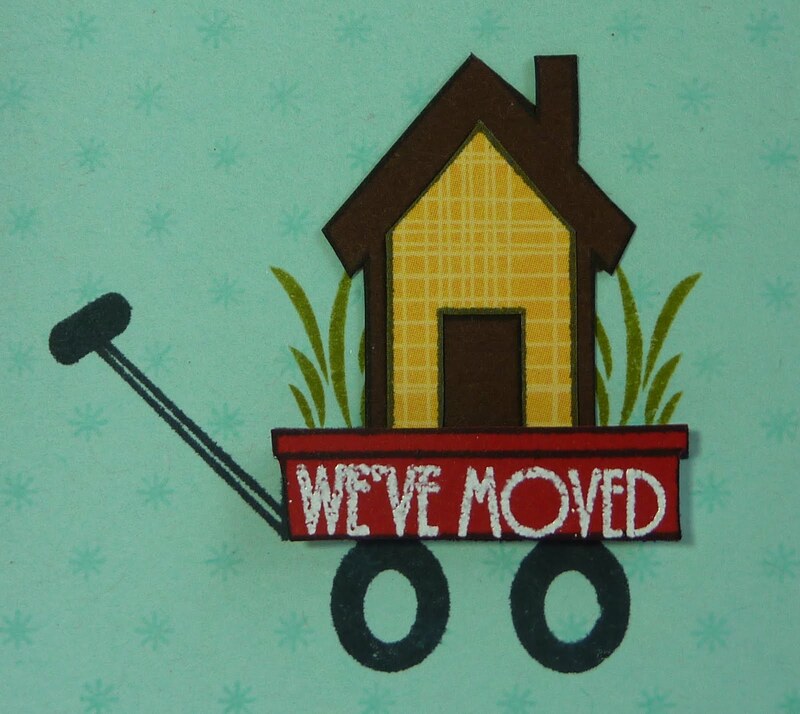 Before cutting out the red wagon, I heat embossed "WE'VE MOVED" onto it with white embossing powder. I love how this gives it the look of a classic Radio Flyer wagon. 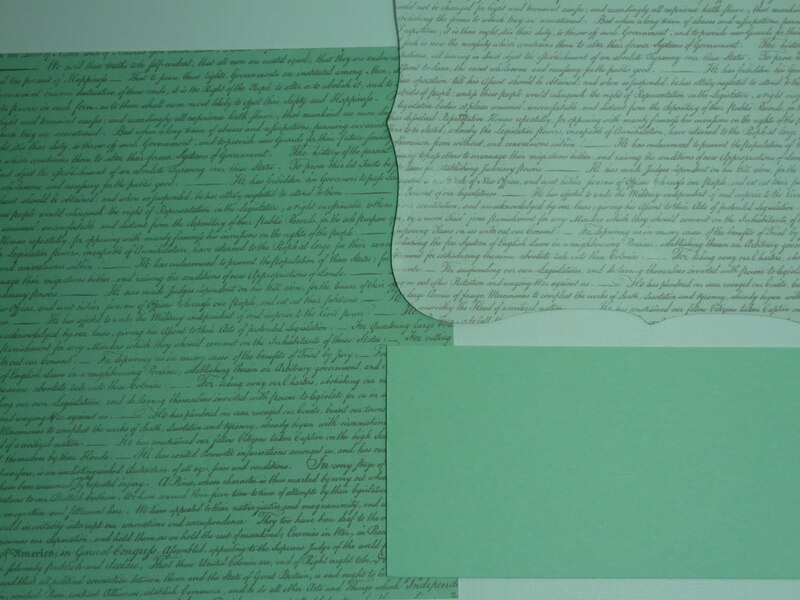 The grass is also stamped right on the background paper. 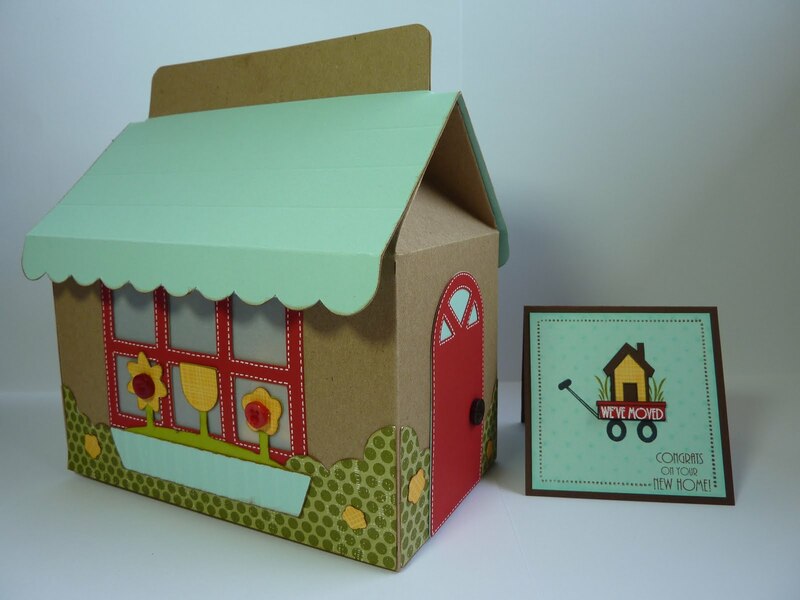 To make the house, I stamped it once on brown cardstock and once on yellow patterned paper before cutting them out and assembling them. Since packing takes a lot of energy, I made a coordinating box full of treats using the Cricut Sweet Tooth Boxes cartridge. 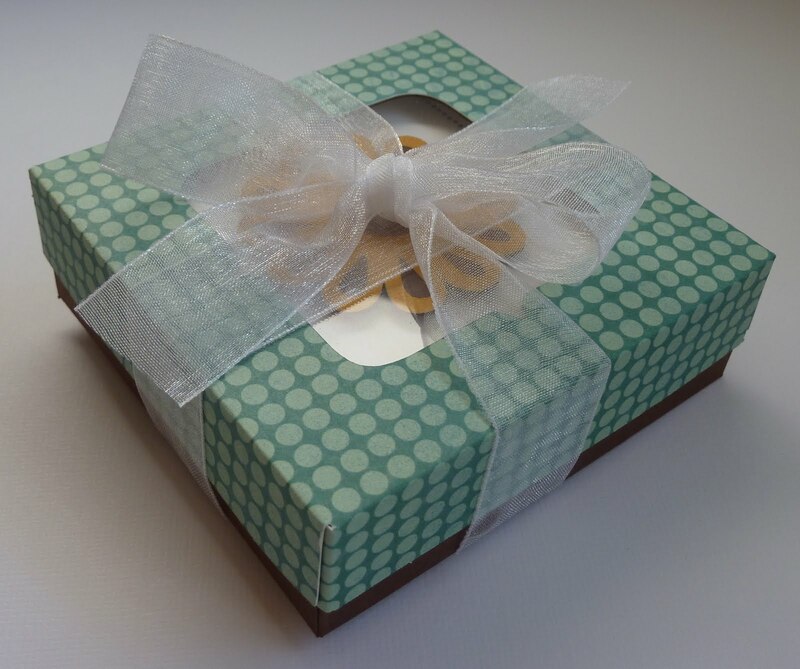 The details on making the box are on my post on Everyday Cricut today. I have TWO giveaways today! 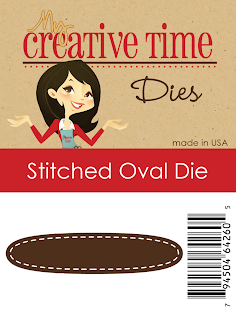 First, as part of the blog hop, I am giving away the Stitched Oval die shown below! All you have to do is leave a comment here, as well as on the rest of the design team's blogs (don't forget to leave a way for me to contact you)! You have 11 chances to win, by leaving comments on ALL of the blogs in this hop by midnight on Sunday! 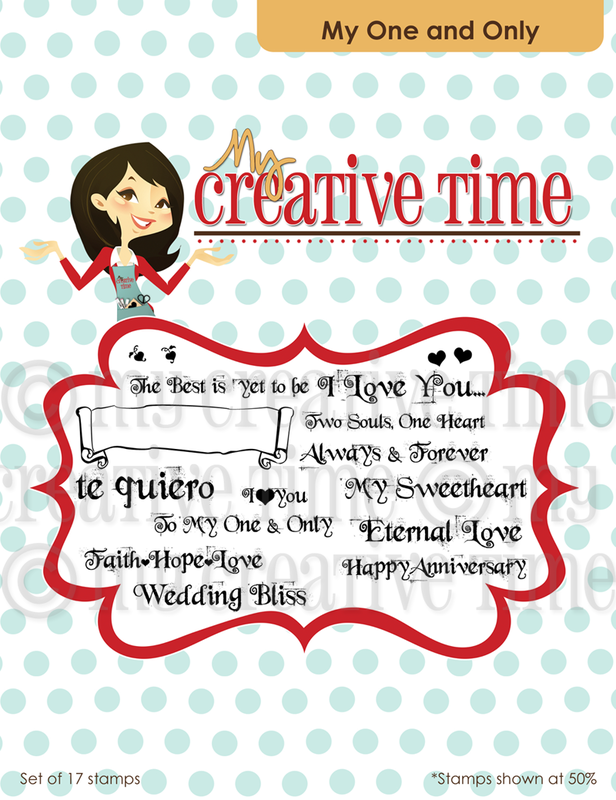 The second giveaway was donated by My Creative Time in honor of my guest designing on Everyday Cricut this week. 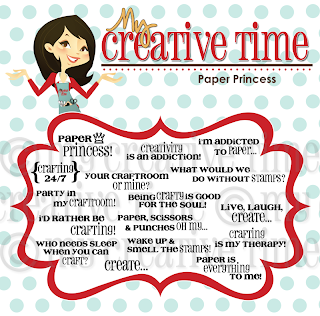 For this giveway, I have the adorable Paper Princess stamp set shown below. Please leave a comment for a chance to win! 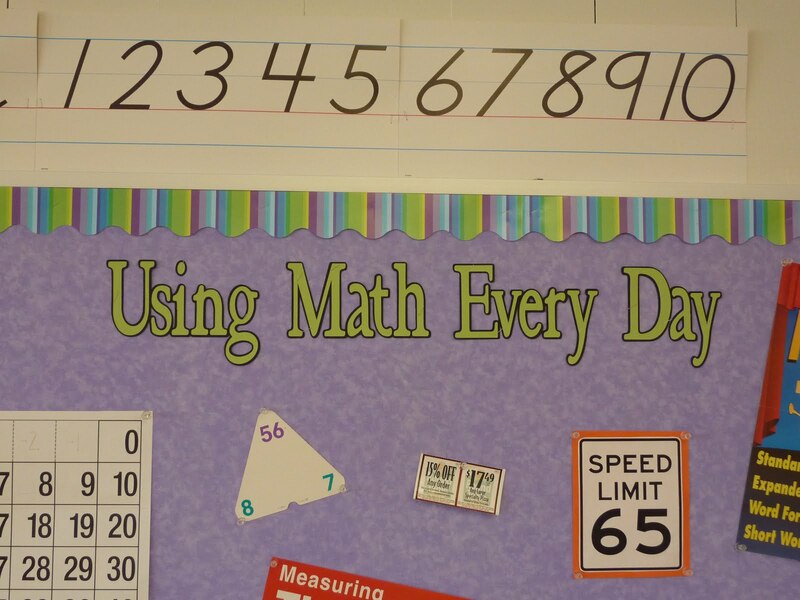 Welcome to another day of My Creative Time Sneak Peek week! Today is our last sneak before tomorrow's official release, and we saved the best for last! 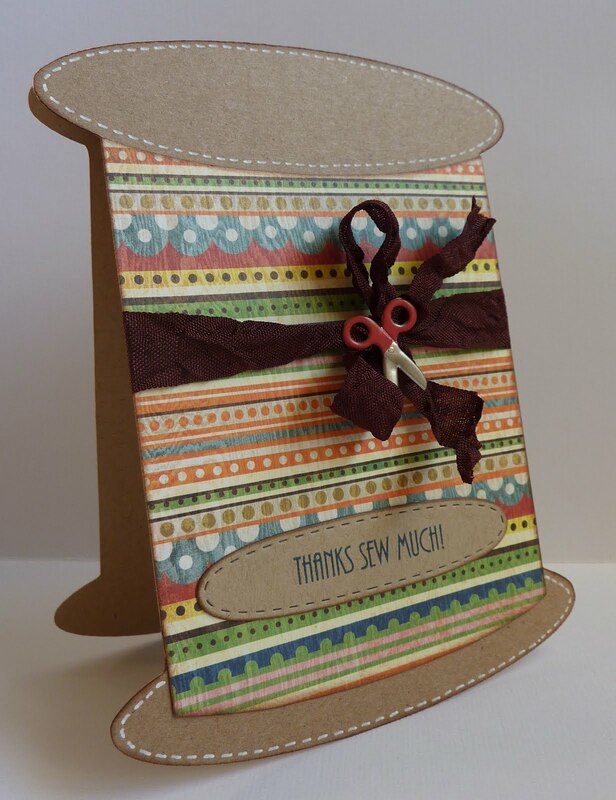 Emma has created a gift card holder die and coordinating sentiment stamps! Having lots of males in my family who are difficult to shop for, I find I buy a lot of gift cards. In the past, I've used my Cricut to make cute gift card holders, but they were very time consuming. This die makes it a breeze! I just ran it through my Cuttlebug, and there it was, with built in notches for closure and for holding the gift card, as well as some beautiful embossing around the edges! 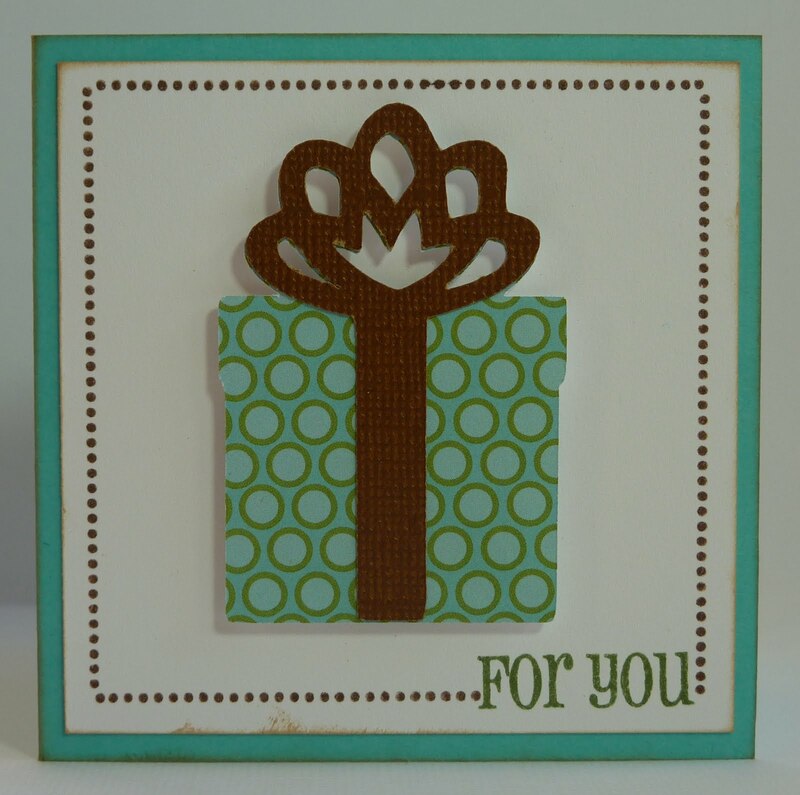 I stamped "Happy Birthday" from the Gift Card Sentiments stamp set that coordinates with the die. 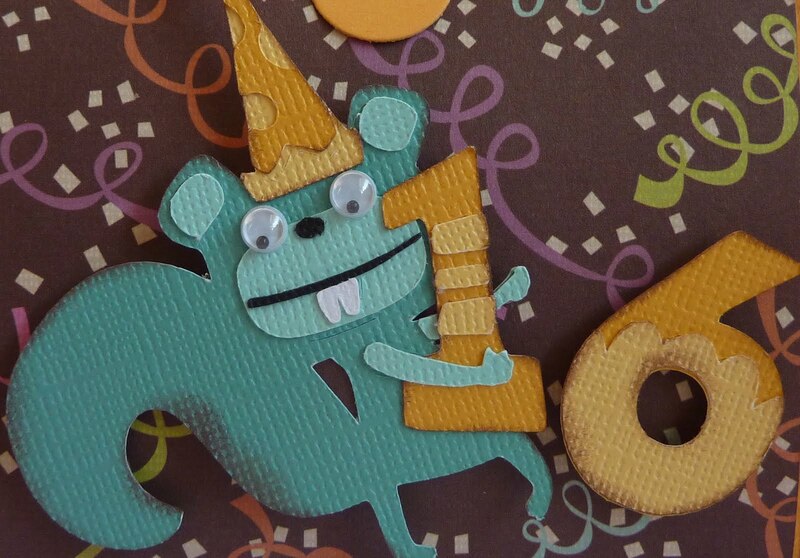 Now I made this gift card holder for my son Eric, who turned 16 on Tuesday! 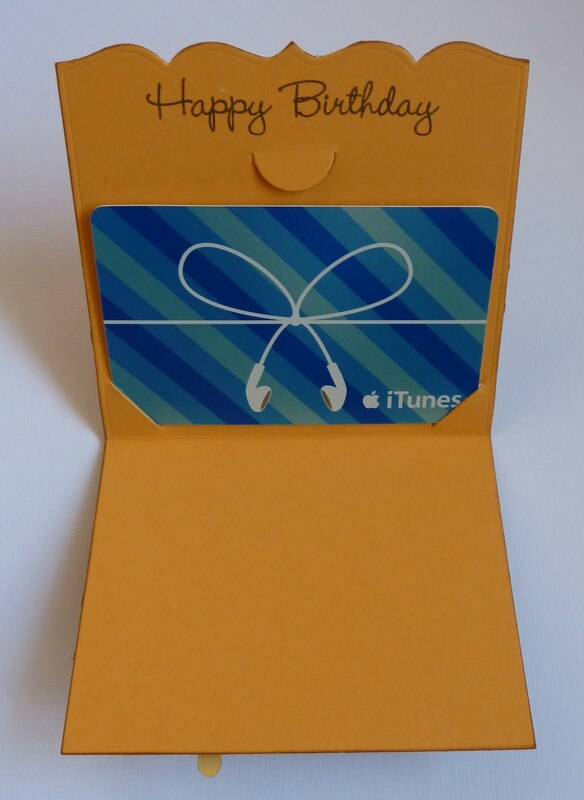 He loves his iTunes, so I had to include a gift card as part of his present. To decorate the front of the holder, I adhered a 2 9/16" x 3 9/16" piece of patterned paper. 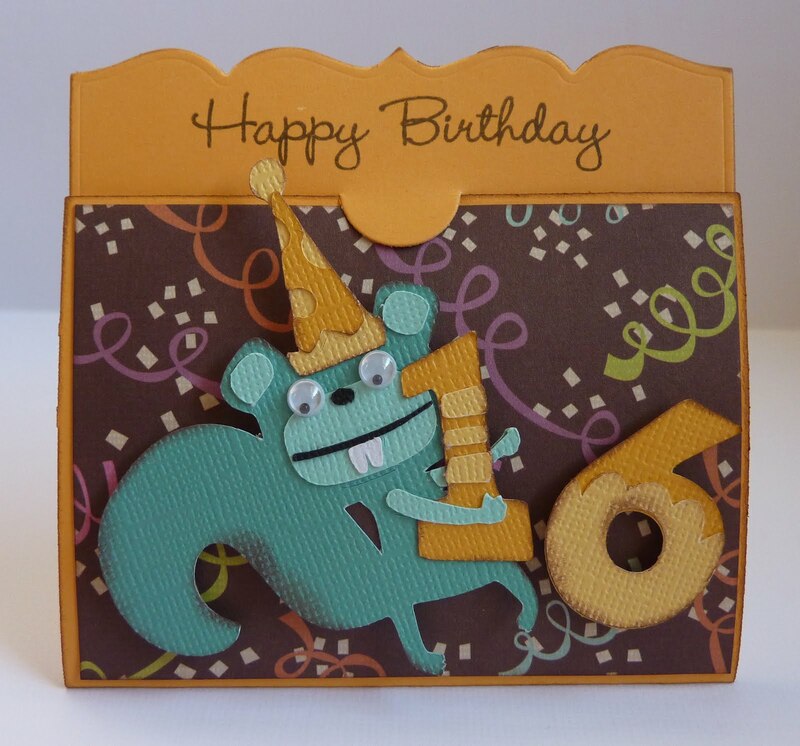 Then I added the cute squirrel from Birthday Bash, cut at 2". He comes holding a "1", and then I also cut the "6" from this cartridge, at 1 1/2". 1. Spread the word to the world on Facebook & to whatever connections you have about this release. 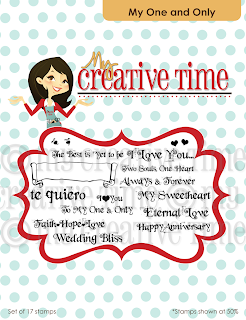 Let us know that you did so on My Creative Time's Facebook page, OR just tag Emma in your post! 2. Just comment on ALL of the designers' blogs EVERY DAY during Sneak Peek Week! That's ALL you have to do to qualify for the BEST giveaways ever! The winners will "randomly" get chosen, and Emma will announce all six winners on Friday, August 19th, at 8:00 AM PST in her video during the release of this AMAZING new stamp collection and dies! Good luck! 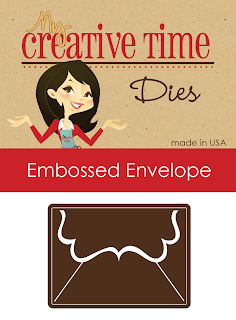 Now, because I am guest designing at Everyday Cricut this week, Emma has also donated her Happy Mail Stamp Set and Embossed Envelope die shown below for me to give away. Just leave a comment on this post by Saturday at midnight, and I'll announce the winner on Sunday! Also, if you haven't visited Everyday Cricut today, please stop by to see another fun new project that I have posted over there. 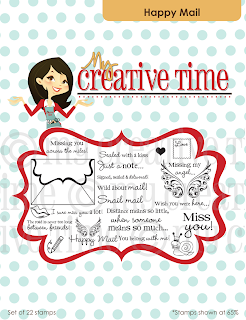 And be sure to stop by My Creative Time to see Emma's sneak peek and to get links to all of the designers' fun sneak peek projects! Are you ready for another sneak peek? 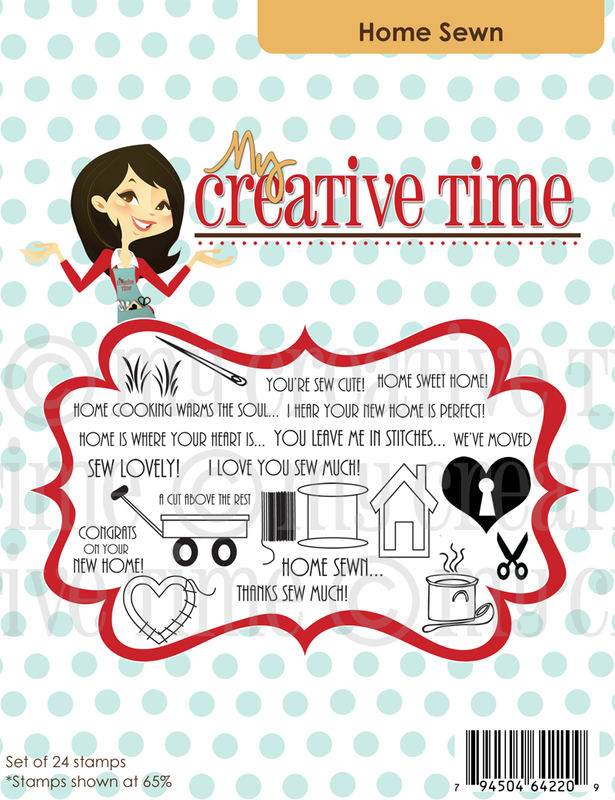 I am so excited about the new My Creative Time stamp set that I used for today's project! Emma came up with such an original idea that is just PERFECT for those 3 x 3" cards. 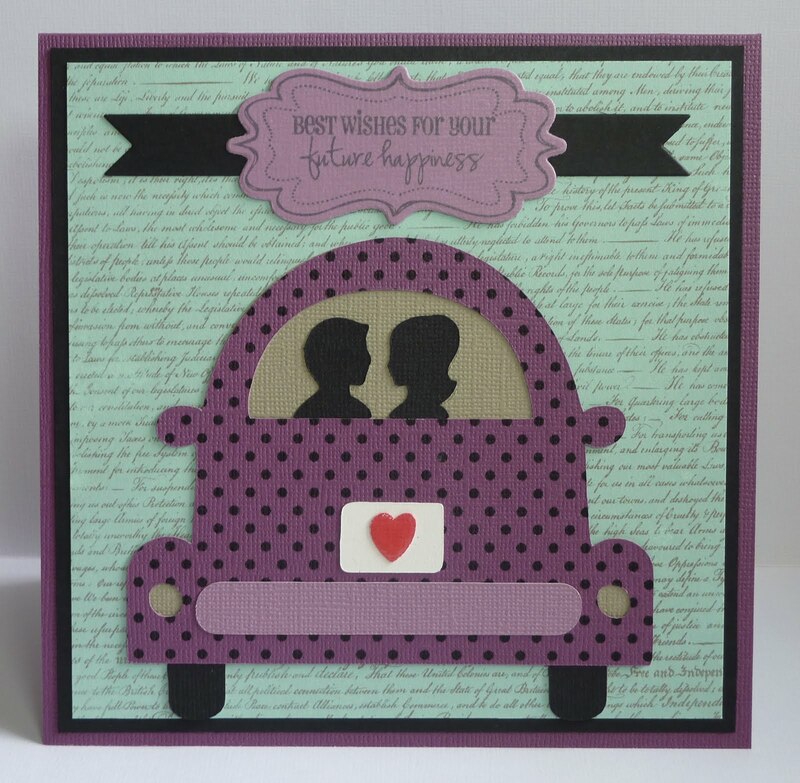 Small Talk includes this dotted border and lots of cute sentiments that fit in it just perfectly! And, you will discover that many sentiments from Emma's other stamp sets will fit in there too! I decided to make a little box of cards for a friend's birthday. My cards are actually 3 1/4" square. For each one, I cut my base paper at 3 1/4" x 6 1/2" and scored at 3 1/4". I then cut two 3" white squares - one for the outside and one for the inside. For the outside ones, I stamped each with the dotted border and a sentiment. All of my Cricut cuts on the cards are from the Art Philosophy cartridge. This tree is cut at 2 1/4". The vase of flowers is cut at 2 1/4" as well. The flower is cut at 2". And the present is cut at 2 1/4". Remember, Art Philosophy is a Close to My Heart exclusive cartridge, so you can only buy it from a Close to My Heart representative. I bought mine from Melanie of Everyday Cricut and Courtney Lane Designs. Click here for her CTMH page. It was easy to make coordinating envelopes using the Walk in My Garden Cricut cartridge. I cut them at 3 1/4", and the cards fit inside perfectly! Now, such cute cards deserve some cute packaging! 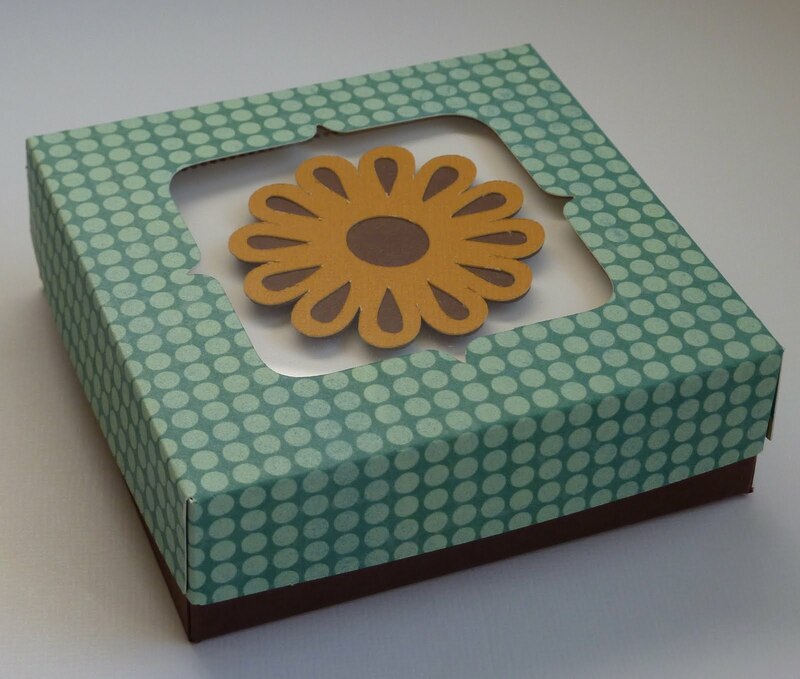 I cut this box at 6" from the Cricut Sweet Tooth Boxes cartridge. There are several different lids to choose from, and I liked this window one that would let my cards peek through. I just cut a square piece of transparency film (leftover from when we used overhead projectors in my school) and adhered it to the inside of the lid. I finished it off with some pretty organza ribbon! Now, because I am guest designing at Everyday Cricut this week, Emma has also donated her All Star Baby stamp set shown below for me to give away. Just leave a comment on this post by Saturday at midnight, and I'll announce the winner on Sunday! Also, if you haven't visited Everyday Cricut today, please stop by to see another fun new project that I have posted over there. 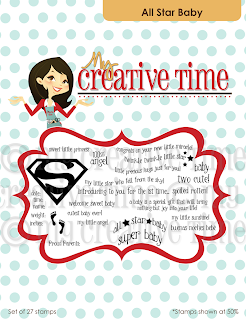 And be sure to stop by My Creative Time to see Emma's sneak peek and to get links to all of the designers' fun sneak peek projects! 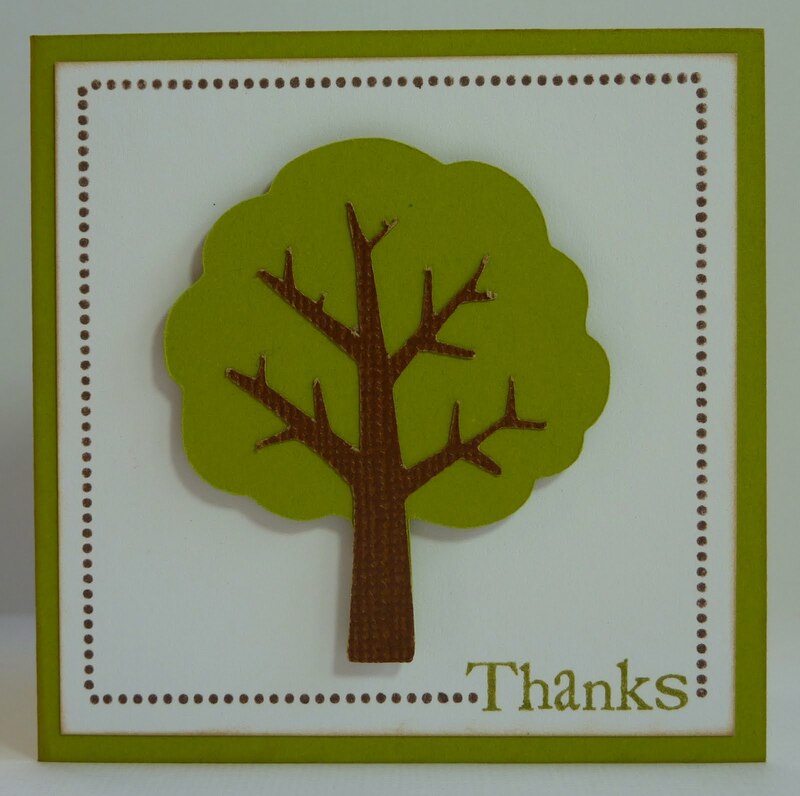 Before I get started, I'd like to welcome my new followers and visitors from Everyday Cricut, and I want to thank everybody for their sweet comments! I really appreciate all of you! 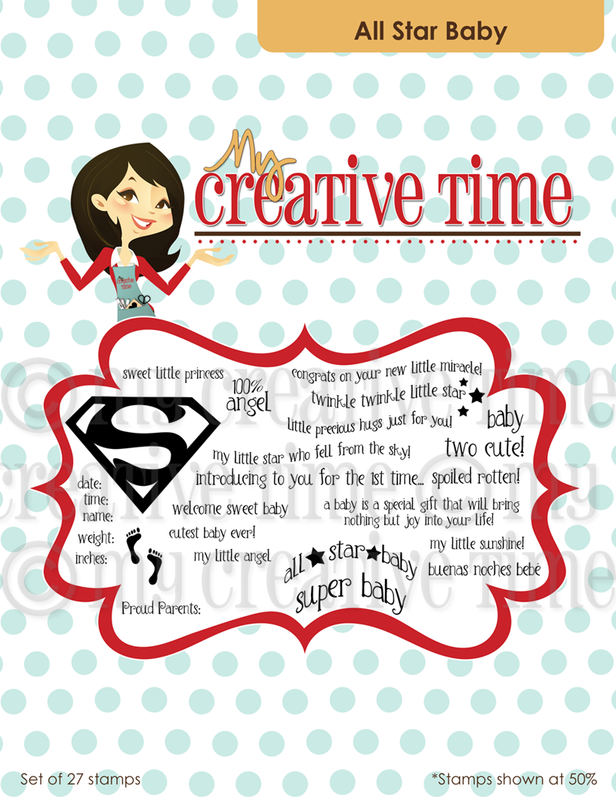 The fun continues today with our second My Creative Time sneak peek! My card today is very simple. I wanted to showcase this adorable patterned paper that I just got at the Scrapbook Expo last weekend. 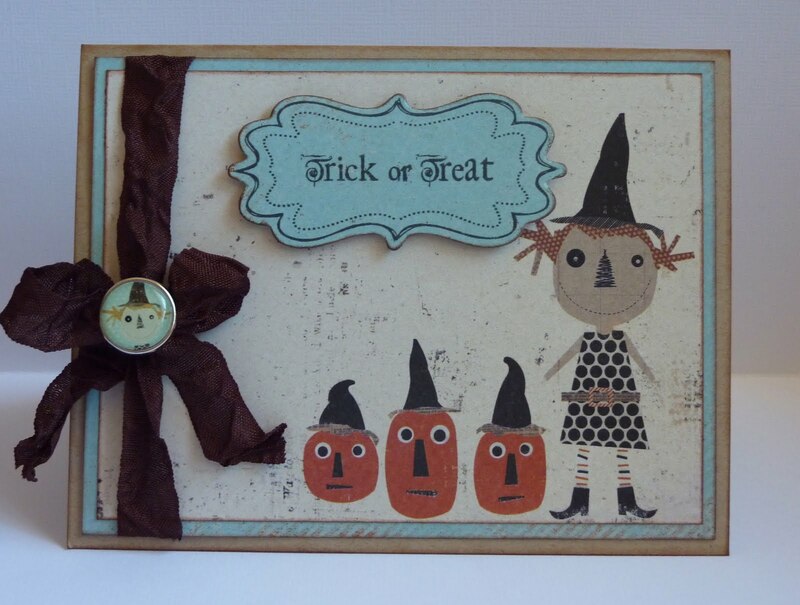 It's called Mischievous, by My Mind's Eye, and I couldn't resist this little rag doll and pumpkins. Too cute! Here's the sneak peek for today! Emma has come out with a new die and coordinating stamp called Fancy Frame. 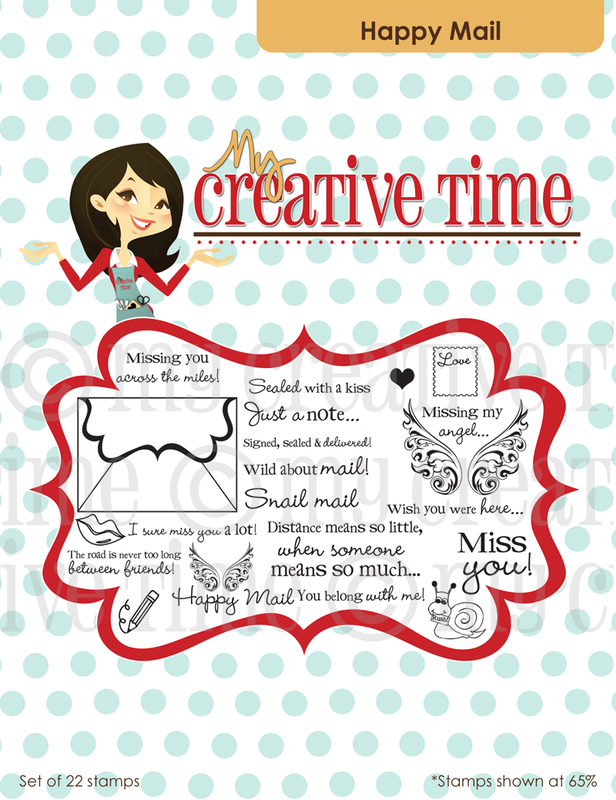 It's a great size that will work well with so many different My Creative Time sentiments. 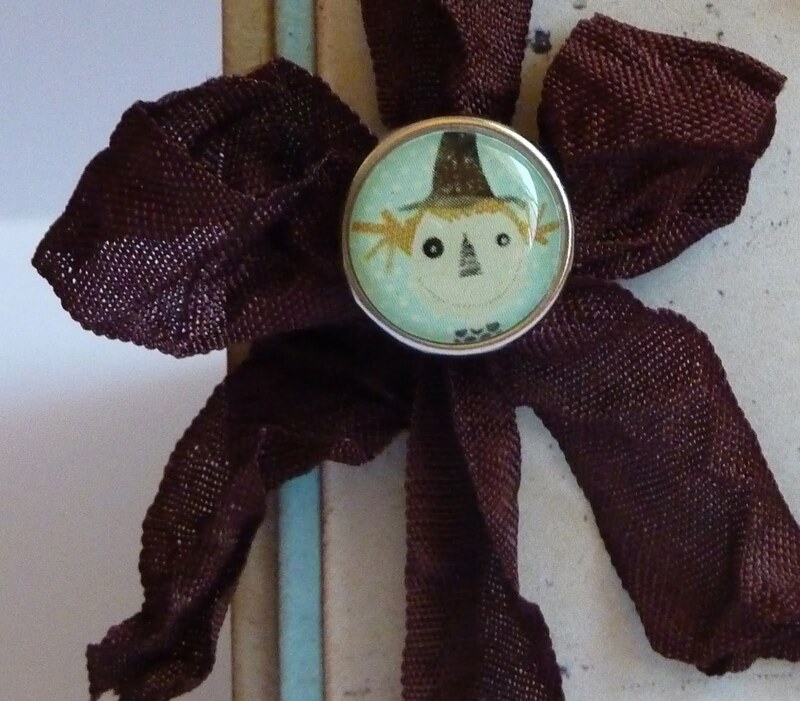 The adorable sentiment that I used is another sneak peek. It's from a stamp set called Mixed Holiday Sentiments, and I love this set! 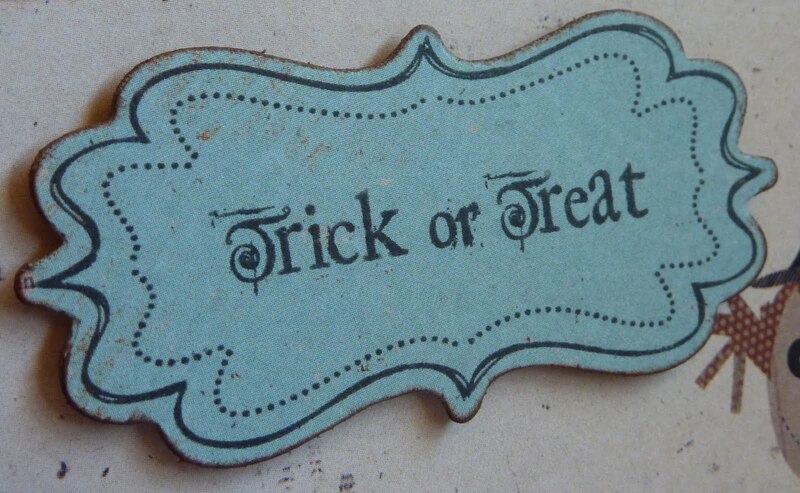 Isn't that a great spooky Halloween font? 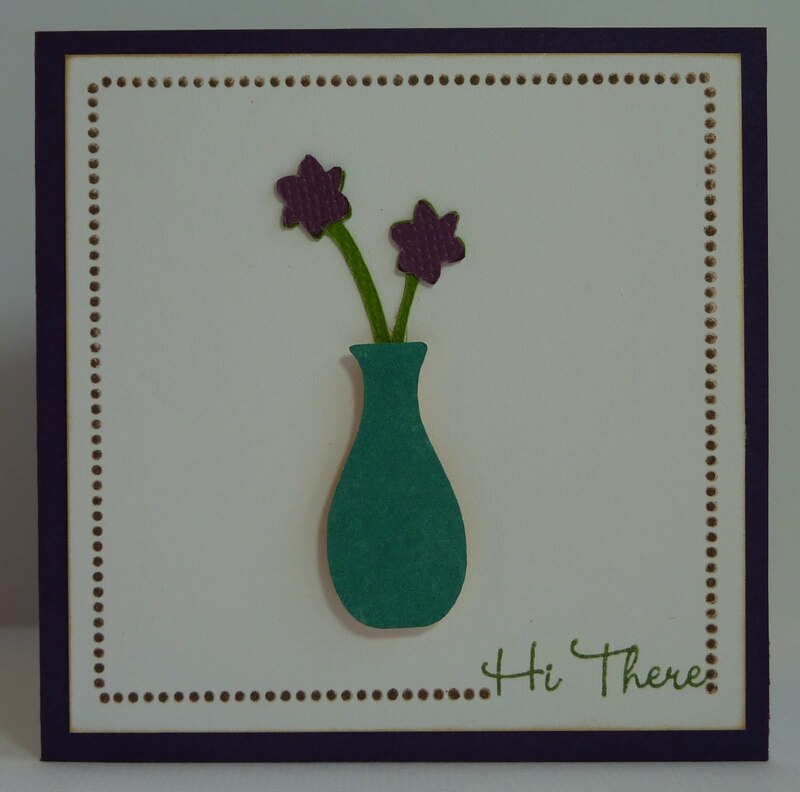 I stamped it on more of the patterned paper from the Mischievous collection. I used some crinkle ribbon to make a bow, and then attached a cute brad that coordinates with the patterned paper. I actually removed the metal prongs of the brad with pliers and then attached it to my bow using my hot glue gun. Now, because I am guest designing at Everyday Cricut this week, Emma has also donated her My One and Only Stamp Set shown below for me to give away! Just leave a comment on this post by Saturday at midnight, and I'll announce the winner on Sunday! Also, if you haven't visited Everyday Cricut today, please stop by to see another fun new project that I have posted over there. 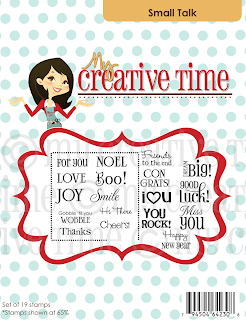 And be sure to stop by My Creative Time to see Emma's sneak peek and to get links to all of the designers' fun sneak peek projects! Before I get started, I'd like to welcome any new visitors from Everyday Cricut! If you like what you see, please follow or subscribe. :-) This is a very fun week! 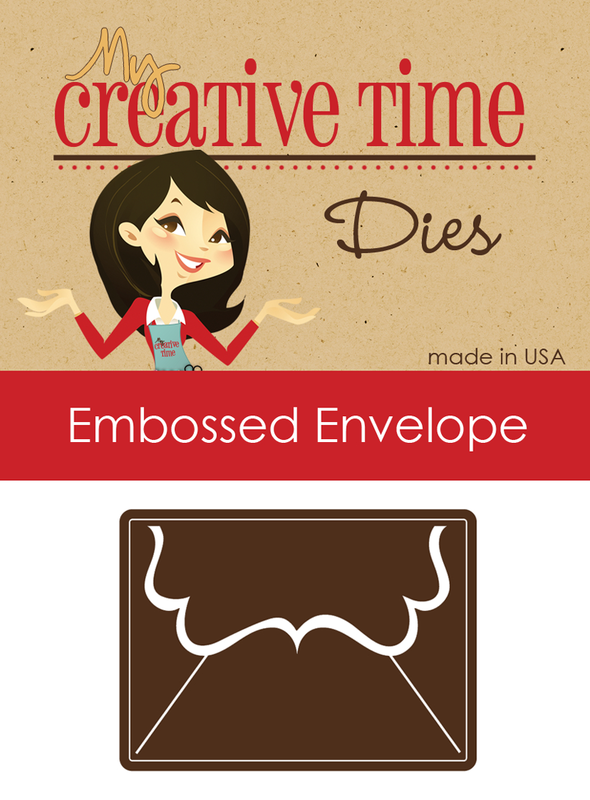 In addition to my being a guest designer at Everyday Cricut, we are doing sneak peaks of the four brand new stamp sets that Emma, at My Creative Time, is releasing this Friday! You will not get over how cute these stamps are! I created this card completely in my Gypsy. It's 4 1/4" x 5 1/2", and I made it by resizing and welding together ovals and rectangle from Gypsy Font. If you've never tried welding on your Gypsy, I made a quick video explaining how to make this. Here is the sneak peek. 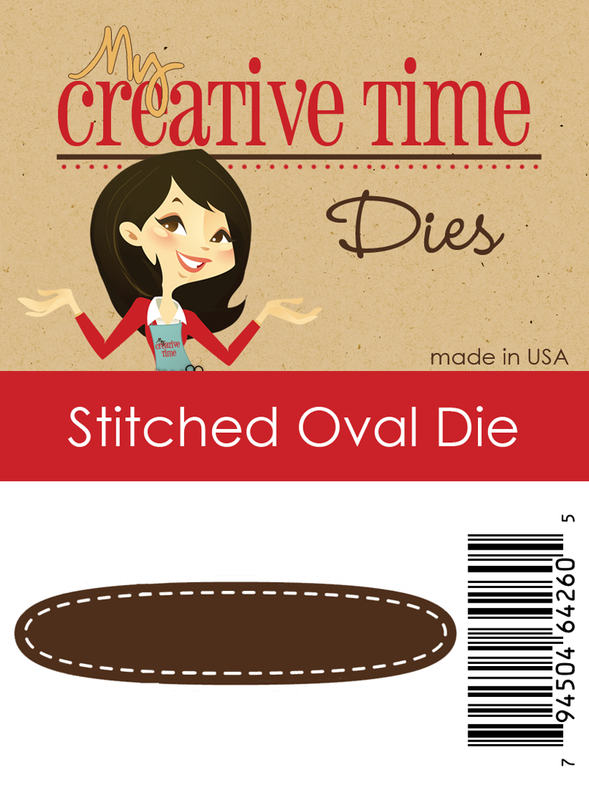 Emma has created this adorable stitched oval die that I absolutely love! So many of her sentiments from all different stamp sets will fit in here! 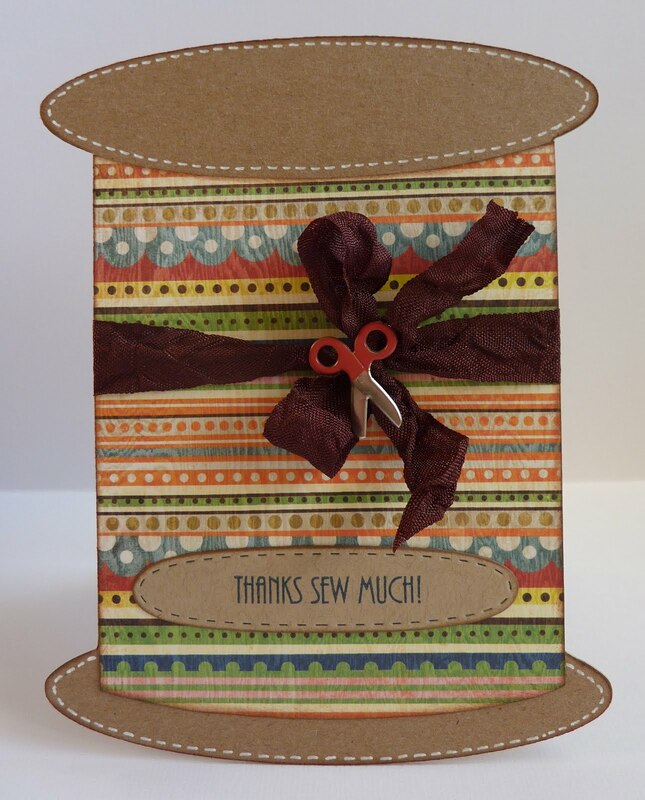 This sweet "Thanks sew much" sentiment is from a brand new set called Home Sewn. 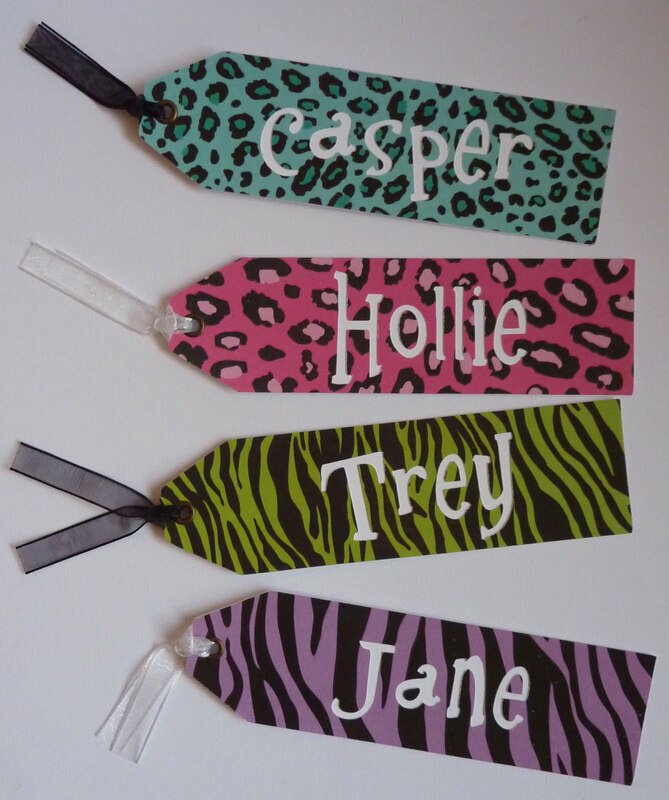 Last month I found the cutest set of Doodlebug brads that just happen to go perfectly with Home Sewn! 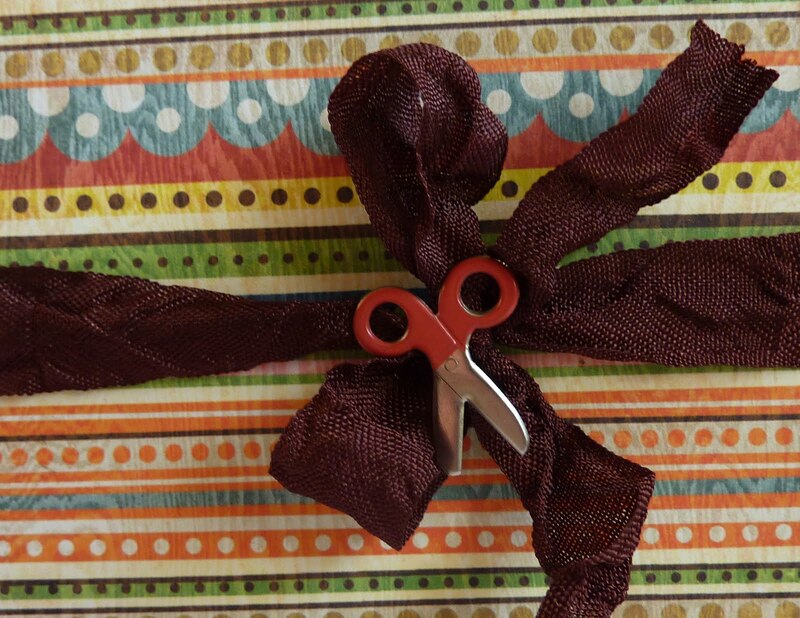 I thought the scissors brad looked pretty cute on the crinkle ribbon bow.